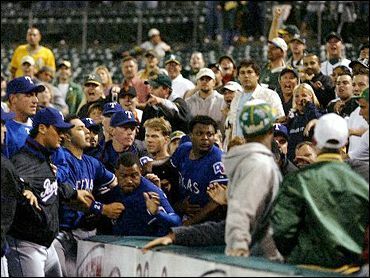 Texas pitcher Frank Francisco threw a chair at a fan in a lower box seat to the left of the Rangers' bullpen along the right-field line in the ninth inning of a game against the Athletics in Oakland on Monday night. The incident boiled over as Texas reliever Doug Brocail was seen screaming at a male fan, and the pitcher had to be restrained by his teammates and bullpen coach Mark Connor. Others also had to be held back. Francisco then tossed the chair at a fan. The chair hit one man in the head, then bounced and clobbered a woman in the face and broke her nose. Security ran to the scene and a small section of fans was cleared from their seats. The incident caused a 19-minute delay. Dave Rinetti, vice president of stadium operations, stood in front of that section for the remainder of the game. "Tonight, it went over the line," Rangers manager Buck Showalter said. "It was a real break from the normal trash you hear from fans. We've had problems about every time we've come here." There was talk between the umpires and managers of suspending the game, clearing the stands and forfeiting the game. Major league baseball's commissioner's office said Tuesday it was investigating. Rinetti said afterward that the woman, not yet identified, was being treated at a hospital for facial cuts and a broken nose, and was considering pressing charges. Francisco was escorted by police out an alternate stadium exit after the game and into a car waiting on the field. No arrests were made at the time, but it was reported Tuesday that the woman is considering pressing charges. Brocail declined comment, and Francisco wasn't around the locker room afterward. Showalter said reliever Carlos Almanzar had to come out of the game after having an asthma attack because of the incident. "I don't know what happened, but I don't think anyone is happy about it," Texas pitcher Francisco Cordero said.